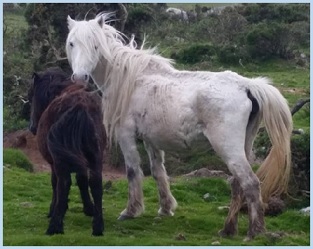 During 2016, People4ponies has undertaken ground-breaking research to investigate the equine welfare problems on Bodmin Moor. The research investigated 2 Commons on Bodmin Moor which have persistant equine welfare problems - Minions/Caradon Hill; and East Moor. 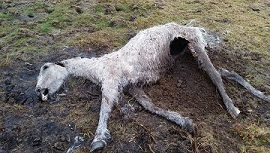 East Moor was highlighted to the media and public during 2016 through the People4ponies blog, which featured the ongoing crisis in an effort to get action for the ponies on this Common. Between February and June 2016, 23 ponies died and at least 42 were seized in emaciated condition. Other dead livestock were also found onsite. In an effort to understand the causes of the annual problems, and to find workable solutions which could prevent the regular occurences of equine welfare problems, scientific testing has been undertaken and experts consultated on the results and interpretation of this data. In order to bring about long term change, the results will need to be acted upon by the owners of the animals, the Bodmin Commoners’ Council, the landowners, and the authorities to address the problems which have been highlighted. It may be public pressure which ultimately brings about any change. The results for East Moor focus around deficiencies and a combination of factors contributing to starvation. The results from Minions/Caradon reveal heavy metal toxicities and deficiencies, and implications for equine health - and for toxicity being passed into the human food chain. The Minions/Caradon Hill moorland area is part of an area designated as a UNESCO World Heritage Site because of its mining history. These are areas of intense historic mining activity and have been designated SSSI status because of the heavy metal content present on site. The impact of the heavy metals on livestock does not appear to have been taken into account. The ponies that were tested in our research were relatively young and they already had high levels of bioaccumulation of certain heavy/toxic elements. The impact of toxicities on site has so far been underestimated in assessing and understanding the animal welfare problems on Minions and Bodmin Moor. Included in the results of the ponies tested were toxic levels of arsenic, iron, manganese, lithium, and aluminium. The level of arsenic recorded in the first pony tested was so high, our expert suspected that it was mostly likely the cause of death of the pony. Levels of toxic elements uranium and beryllium were also returned. Ponies returned deficiencies in key minerals calcium, molybdenum, phosphorus, potassium, selenium, sodium, sulphur and zinc. The toxicity of certain elements on-site (such as arsenic, iron, and manganese) can further cause deficiencies in uptake of particular minerals, such as zinc. All the ponies tested were low in zinc, one pony to a critically low level. Water test results (some of which are displayed in the table above) were particularly concerning. Water sample 1 returned a huge level of arsenic toxicity 182 times above the human limit and well above the recommended maximum livestock limits. All the samples returned levels of iron above the recommended livestock limit and 2 samples returned levels of manganese higher than recommended limits. Acidic pH’s, and nitrate levels above recommended levels were returned in samples. The levels of mineral deficiency onsite have also not been appreciated. Forage results showed the site is deficient in 6 of the 7 major minerals. The levels of these minerals onsite do not meet the daily minimum requirements of breeding or non breeding animals. High levels of iron and manganese are present both in the forage and the water. Soluble forms are much more readily absorbed by the body and cause toxicity, which then impacts the metabolism of other key minerals needed for health. Whilst it is usually claimed that animals in poor condition have been dumped or abandoned in this condition on this site, the results suggest that the deficiencies and toxicities have been gained whilst inhabiting this environment. Whilst some abandonment of animals may take place, the environments are impacting on the animals. It is generally known that horses from this area are passed into the human food chain. Where horses are being passed into the human food chain, there needs to be awareness that any toxicity accumulated will be passed on to the consumer. Those feeding horses from the Minions/Caradon area to other animals need to be aware of the toxicity they are passing on through the food chain - this can include scavenging wildlife, hunting dogs at kennels, and zoo animals. 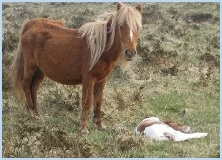 Those with ponies rescued, purchased, or born to mares from this area of moorland (toxic elements are passed onto the foetus during pregnancy), can take advice on feeding programmes to safely release toxicity, particularly for animals that are experiencing health problems. It is possible to address toxicity issues through specific feeding plans. Toxicity is not removed by changing pasture or removing an animal from the moorland area. Even if an animal regains bodily condition, toxicity is not released without feeding particular antagonists. Without removal, the toxicity continues to impact upon levels of mineral uptake and deficiencies. Toxicity can only be removed whilst an animal is still living – it cannot be removed once an animal is deceased and this is why there are concerns over what is entering the food chain. Further testing should be conducted on other Bodmin sites with previous mining activity, particularly those Commons with ongoing animal welfare problems. Ponies on this site require supplementation by their owners of hay and minerals. They also require a safe source of drinking water and toxic areas to be fenced off or decontaminated. To read the full report about Minions/Caradon, please click here. On East Moor, heavy metal toxicity is not proving to be an issue on site. Mining activity here related more to streamwork channels rather than intensive mining. Instead, a combination of factors are shown to cause the welfare problems - lack of grazing and a seasonal decline of pasture (a lack of protein is also indicated), long term mineral deficiencies, high worm burdens, increased dietary requirements of pregnant and lactating animals which have not been met, compromised health, overstocking, a lack of management, a slowness to act by the authorities, no supplementation of animals, a lack of enforcement of identification of animals, the low value of moorland ponies, an atmosphere of hostility, and a reactive rather than preventative approach from the authorities. Only one pony on East Moor had a profile with toxic levels of iron, high levels of aluminium, beryllium and uranium, and a level of arsenic. 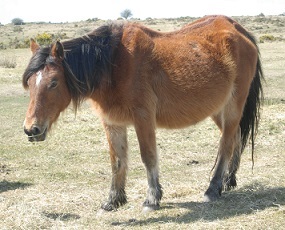 It is believed that this pony had been brought to the moor from another area, or that it had inherited toxicity if it had been born on East Moor. Levels of toxicity can effect a ponies’ uptake of minerals, uptake of forage, and effect their health. 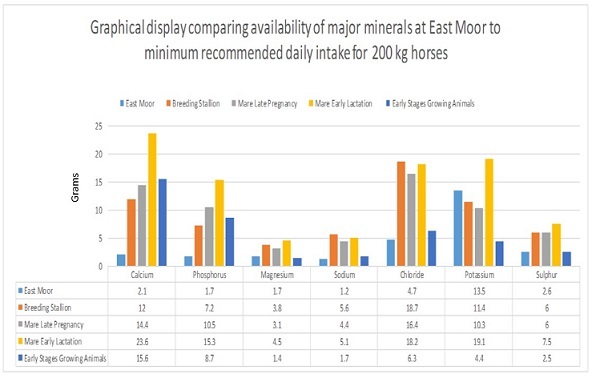 East Moor is so minerally deficient, it lacks even a basic daily minimum mineral allowance of 6 of the 7 major minerals for breeding and non-breeding animals (see the graphs on page 20 of the report). This site is more minerally deficient than Minions/Caradon Hill. The animals were so deficient, some returned critically low level or non-existent levels of some minerals. The adult ponies were particularly deficient in boron, calcium, cobalt, copper, manganese, molybdenum, phosphorus, potassium, selenium, sodium, sulphur and zinc. The worst deficiencies recorded were levels of calcium and zinc. Three of the adults only achieved “good” readings in 4 out of the 15 elements and these were the highest mineral scoring results for individuals of the group sampled. These levels of deficiency will also be impacting the other livestock on-site. The interaction between minerals is complex. In some cases a pair of minerals must both be present for either to be available. In other cases one particular mineral is required for the uptake of another. 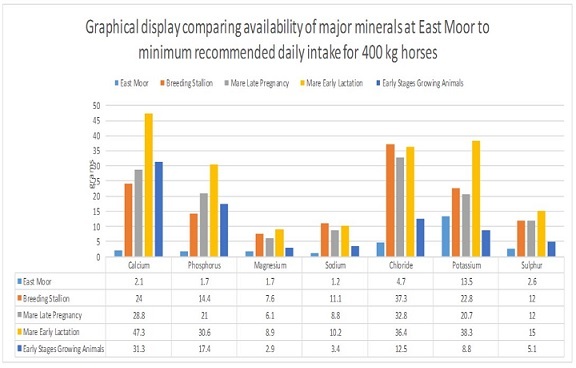 The lack of manganese in the pony mineral results is due to the prolonged lack of grazing and available forage onsite. Forage tests conducted for our research revealed a high level of manganese onsite when forage is available, and a level of iron above daily mineral requirements of ponies, which is likely to be effecting the ponies’ uptake of other minerals such as cobalt, copper, calcium, selenium, phosphorus, and zinc. With zinc, sulphur, calcium, manganese, and cobalt all needed for enzyme function; and sodium and potassium needed to make the nervous system function, these deficiencies may be responsible for the East Moor ponies’ neurotoxic type symptoms that were witnessed (please see the videos below). Some ponies exhibited difficulty walking, muscle weakness, flaccid tails, poor appetite, and difficulty rising. One pony presented with shifting lameness which began during the monitoring period and would vary between different limbs on different days. Monitored ponies continued to present these symptoms over a long period of time. The lack of removal of carcasses leaves equine populations vulnerable to the possibility of botulism. Of all the pony carcasses on East moor, only 6 were buried in a mass burial pit and one was removed by the authorities in June. Other than this, carcasses of dead ponies, sheep, and cows seem to be routinely left to decay on East Moor. General medical consensus was that the ponies would have died within a quick timescale once symptoms were displayed if they had been suffering from botulism. We cannot conclusively say whether botulism has or has not led to the death of any animals out on the moor. We can only state that the lack of carcass removal is known to present a disease risk to equines. The progress made through drifting the entire population of East Moor and removing stallions, worming, and identifying animals needs to be maintained and built on. A management system needs to be established with annual roundups, removal of colts, identification of animals (through passporting and micro-chipping), and a worming strategy. A system needs to be established with a knowledgeable and skilled set of individuals who can promptly and safely drift animals from the moor, and ensure a removed animal receives veterinary assessment and treatment. There needs to be enforcement of quotas of livestock to prevent overstocking. Whilst the round up on East Moor in September 2016 is a very positive step, supplementing the equine population throughout the winter is going to be a key factor in ensuring the survival of animals on this area of moorland. The Animal Welfare Act 2006 states that animals must be provided with a suitable environment, suitable diet, and be protected from pain, suffering, injury and disease. East Moor has persistent annual welfare problems and the authorities should look to take a preventative rather than reactive approach - winter feeding of ponies on this area needs to be compulsory as does the provision of minerals. If owners have no intention of feeding ponies on the moor then they must be removed from East Moor for the winter, which already happens with the cows and sheep. Scenes such as these cannot be allowed to happen again. 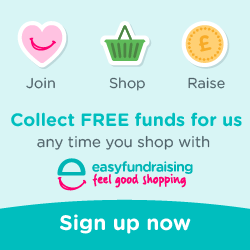 To read the full report about East Moor, please click here. Both Minions/Caradon and East Moor sites have in common in marked mineral deficiencies. Supplementary feeding needs to be compulsory on these sites during the winter and there needs to be provision of minerals all year round. It is very important that this comes from owners and/or from the Commoners' Council and the authorities. The animals are owned and should NOT be fed by the public. This can cause fighting between animals, cause the ponies to approach cars making them susceptible to road traffic accidents, and horses are susceptible to colic from eating the wrong foods. If the public would like to help we would urge them to see assurances from the Commoners' Council, Defra, and their MP that the ponies are fed this winter; and that clean water supplies are provided for livestock and at Minions/Caradon the dangerous water sources are sectioned off. If hay is sourced from areas away from Bodmin the better mineral content would benefit the ponies. If feeding cannot take place on the Commons, then ponies should be removed from the moor for the winter as already happens with cows and sheep. More research needs to be conducted on other Bodmin Commons with welfare problems. The implications of heavy metal toxicity have been under-estimated and there is a general lack of knowledge within scientific and veterinary communities in the UK. Each year Bodmin ponies are bought at the annual market for meat. At one Bodmin pony market there were 2 of these “super” lorries signwritten with “International Haulage, Ireland—UK– Europe”. They carried approximately 40 ponies per lorry. The lorries belonged to a haulier and slaughterhouse which was closed after official investigations into the horse meat scandal. The heavy metal toxicity from mining also has implications for other pony grazing areas, such as Dartmoor, where the minerals tin, arsenic, lead, copper, silver, iron, and zinc were mined and ponies are being passed into the human food chain, potentially passing on toxicity to consumers. 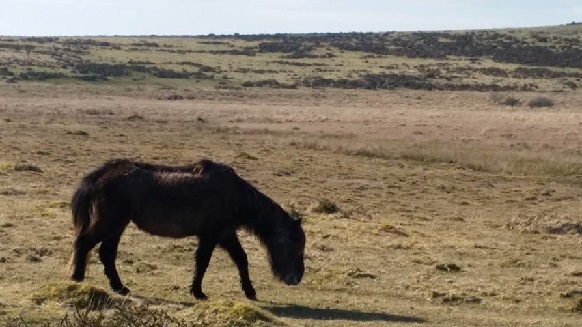 Being a moorland rescue, tests on our own P4P ponies clearly show that some animals rescued from Exmoor have toxicity profiles which links them back to the Bodmin area - pony trading from across areas is known to take place.